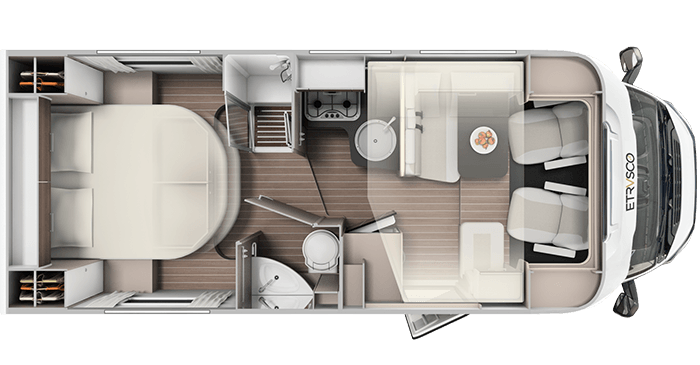 The modern kitchenette, the space-saving bathroom and the comfortable sleeping area in the T6900QB model make travelling more enjoyable. 1) With optional weight upgrade to 3.850 kg, towing weight is reduced to 1.900 kg. 2) General note on permitted persons: With the installation of factory chassis options, optional equipment and packages, the permitted number of passengers can be reduced or a load uprating may be needed (see optional extras). Homologation of more than 4 persons only in conjunction with the optional 5th seat. 3) When ordering the option “bed conversion” please note that the wardrobe is replaced by a seat including overhead locker. 4) Capacity of fresh water tank within the Regulation (EU) 1230 / 2012, taking into account the limitation valve on the fresh water tank (20 litres) is open. The maximum gross vehicle weight and the permissible axle load may not be exceeded. In accordance with VO (EU) 1230 / 2012 the “mass in running order” includes 20 l fresh water, 1 × Aluminium gas bottle (15 kg) and a cable drum (4 kg). Despite careful editorial control this catalogue may contain errors and as such no information contained within is binding, nor constitutes an offer from Etrusco or its local retailers.